Henry Martin "Scoop" Jackson (May 31, 1912 – September 1, 1983) was an American politician who served as a U.S. Representative (1941–1953) and U.S. Senator (1953–1983) from the state of Washington. A Cold War liberal and anti-Communist Democrat, Jackson supported higher military spending and a hard line against the Soviet Union, while also supporting social welfare programs, civil rights, and labor unions. Born in Everett, Washington, to Norwegian immigrants, Jackson practiced law in Everett after graduating from the University of Washington School of Law. He won election to Congress in 1940 and joined the Senate in 1953 after defeating incumbent Republican Senator Harry P. Cain. Jackson supported the major civil rights of the 1960s and authored the National Environmental Policy Act, which helped establish the principle of publicly analyzing environmental impacts. He co-sponsored the Jackson–Vanik amendment, which denied normal trade relations to countries with restrictive emigration policies. He was born in the home of his parents, Marine (Anderson) and Peter Jackson, in Everett, Washington. Both parents were immigrants from Norway. Peter Jackson was born Peter Gresseth, and changed his name when he immigrated. He met Marine at the Lutheran church in Everett, where they were married in 1897. Henry was the fifth and youngest of the Jackson children. Jackson was nicknamed "Scoop" by his sister in his childhood after a comic strip character that he was said to have resembled. He went on to graduate with a bachelor's degree from Stanford University and a law degree from the University of Washington, where he joined the Delta Chi fraternity. In 1935, the year of his law school graduation, he was admitted to the bar and began to practice law in Everett. He found immediate success and was elected to become the prosecuting attorney for Snohomish County from 1938 to 1940, where he made a name for himself prosecuting bootleggers and gamblers. In 1961, Jackson, called by Time the Senate's "most eligible bachelor," married Helen Hardin, a 28-year-old Senate receptionist, but Jackson did not move out of his childhood home, where he lived with his unmarried sisters, for several years. The Jacksons had two children, Anna Marie Laurence and Peter Jackson; Peter was most recently a speechwriter for Governor Christine Gregoire. Jackson successfully ran for Congress as a Democrat in 1940 and took his seat in the House of Representatives with the 77th Congress on January 3, 1941. From then on, Jackson did not lose any congressional election. Jackson joined the Army when the United States entered World War II but left when Franklin D. Roosevelt ordered all representatives to return home or resign their seats. He visited the Buchenwald concentration camp a few days after its liberation in 1945. He attended the International Maritime Conference in Copenhagen, Denmark, in 1945 with the American delegation, and he was elected president of the same conference in 1946, when it was held in Seattle, Washington. From 1945 to 1947, Jackson was also the chairman of the Committee on Indian Affairs. In the 1952 election, Jackson relinquished his seat in the House for a run for one of Washington's Senate seats. Jackson soundly defeated Republican Senator Harry P. Cain and remained a senator for over thirty years. He was Washington's first U.S. Senator to be born in the state. Jackson died in office in 1983 after winning re-election for the fifth time in 1982. Though Jackson opposed the excesses of Joe McCarthy, who had traveled to Washington State to campaign against him, he also criticized Dwight Eisenhower for not spending enough on national defense. Jackson called for more inter-continental ballistic missiles in the national arsenal, and his support for nuclear weapons resulted in a primary challenge from the left in 1958, when he handily defeated Seattle peace activist Alice Franklin Bryant before winning re-election with 67 percent of the vote, which he topped the next four times he ran for re-election. During the 1960 Democratic presidential primary, Jackson was the first choice of fellow Senator John F. Kennedy for a running mate, though JFK became convinced that a Southerner would better balance the ticket. Lyndon Johnson was later selected. Jackson boasted one of the strongest records on civil rights during the civil rights movement. He supported the 1957 and the 1964 Civil Rights Acts. On July 22, 1965, President Lyndon B. Johnson signed the Water Resources Planning Act into law, noting Jackson as one of the Congress members to "have made a very invaluable and very farsighted contribution to America's future." In April 1968, responding to the assassination of Martin Luther King Jr., Jackson gave a speech about the legacy and injustice of inequality. 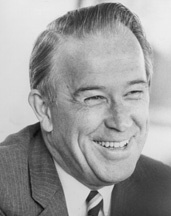 In 1963, Jackson was made chairman of the Committee on Interior and Insular Affairs, which became the Committee on Energy and Natural Resources in 1977, a position he held until 1981. In the 1970s, Jackson joined with fellow senators Ernest Hollings and Edward Kennedy in a press conference to oppose President Gerald Ford's request for Congress to end Richard Nixon's price controls on domestic oil, which had provoked oil companies into withholding gasoline during the 1973 Oil Crisis. Kaufman writes that after 1968, Jackson "emerged as an intellectual and political leader in the perennial struggle of U.S. foreign policy to reconcile ideals with self-interest." Jackson authored the National Environmental Policy Act, which has been called one of the most influential environmental laws in history. It helped to stimulate similar laws and the principle of publicly analyzed environmental impact in other states and in much of the world. Jackson was also a leader of the fight for statehood for Alaska and Hawaii. In 1974, Jackson sponsored the Jackson-Vanik amendment in the Senate (with Charles Vanik sponsoring it in the House), which denied normal trade relations to certain countries with non-market economies that restricted the freedom of emigration. The amendment was intended to help refugees, particularly minorities, specifically Jews, to emigrate from the Soviet Bloc. Jackson and his assistant, Richard Perle, also lobbied personally for some people who were affected by this law such as Anatoly (now Natan) Sharansky. In March 1975, Jackson released a statement in which he expressed the view that it was paramount the Franklin Peroff case be found out to be either "an aberration or was symptomatic of much greater problem" within the Drug Enforcement Administration. In June 1975, Jackson stated that if accounts about the conduct of former director of the Drug Enforcement Agency John R. Bartels Jr. were correct then his actions amounted to obstruction of justice and that evidence disclosed "in the last two days would indicate that there was a conscious, premeditated plan involving misconduct at the highest levels of the D.E.A." In July 1977, the Senate approved a funding for the experimental nuclear reactor compromise proposal by Jackson and Idaho Senator Frank Church. While the initial version by President Carter sought a decrease in funding from 150 million to 33 million, the Jackson and Church measure halved the funding to 75 million. In October 1979, the Senate voted in favor of President Carter's energy mobilization board plan, Jackson labeling the plan the "centerpiece" of Carter's program that was essential to guaranteeing the effectiveness of the rest of the legislation and was noted for successfully persuading colleagues to reject amendments to the plan. Later that month, after the Senate Energy and Natural Resources Committee voted in favor of the Alaska public lands legislation, President Jimmy Carter issued a statement thanking Jackson and other members for supporting the legislation. Jackson also led the opposition within the Democratic Party against the SALT II treaty and was one of the leading proponents of increased foreign aid to Israel. For decades, Democrats who support a strong international presence for the United States have been called "Scoop Jackson Democrats," and the term is still used to describe contemporary Democrats such as Joe Lieberman and R. James Woolsey, Jr.
Jackson served for all but the last three years of his Senate tenure with Democratic colleague Warren G. Magnuson. As a result, he spent 28 years as the state's junior Senator, even though he had more seniority than all but a few of his colleagues. "Scoop" and "Maggie," as they affectionately called each other, gave Washington clout in national politics well beyond its population. They were one of the most effective delegations in the history of the Senate in terms of "bringing home the bacon" for their home state. Washington received nearly a sixth of public works appropriations but ranked only 23rd in population. Jackson was known as a hawkish Democrat. He was often criticized for his support for the Vietnam War and his close ties to the defense industries of his state. His proposal of Fort Lawton as a site for an anti-ballistic missile system was strongly opposed by local residents, and Jackson was forced to modify his position on the location of the site several times, but continued to support ABM development. American Indian rights activists who protested Jackson's plan to give Fort Lawton to Seattle, instead of returning it to local tribes, staged a sit-in. In the eventual compromise, most of Fort Lawton became Discovery Park, with 20 acres (8.1 ha) leased to United Indians of All Tribes, who opened the Daybreak Star Cultural Center there in 1977. Opponents derided him as "the Senator from Boeing" and a "whore for Boeing" because of his consistent support for additional military spending on weapons systems and accusations of wrongful contributions from the company; in 1965, 80% of Boeing's contracts were military. Jackson and Magnuson's campaigning for an expensive government supersonic transport plane project eventually failed. Jackson not only was successful as a politician in Washington State but also found recognition on the national level, rising to the position of chairman of the Democratic National Committee in 1960 after he was considered for the vice presidential ticket spot that eventually went to fellow Senator Lyndon Johnson. Jackson ran for president twice, and both campaigns were noted for the hostile reception they received from the left wing of the Democratic Party. Jackson's one-on-one campaigning skills, which were so successful in Washington State, did not translate as well on the national stage. Even his supporters admitted that he suffered from a certain lack of charisma. Jackson was little known nationally when he first ran in 1972. George McGovern, who eventually won the nomination, even accused Jackson of racism for his opposition to busing despite Jackson's longstanding record on civil rights issues. Jackson's high point in the campaign was a distant third in the early Florida primary, but he failed to stand out of the pack of better-known rivals, and he made real news only later in the campaign, as part of the "Stop McGovern" coalition, which raised what would be known as the "Acid, Amnesty and Abortion" questions about McGovern. Jackson suspended active campaigning in May after a weak showing in the Ohio primary and finishing well behind McGovern, Ed Muskie, George Wallace, and Hubert Humphrey in early primaries. Jackson re-emerged at the August Democratic convention after the runner-up, Humphrey, dropped out of the race. Jackson's name was placed in nomination by Georgia Governor Jimmy Carter, and he finished second in the delegate roll call, well behind nominee McGovern. Jackson raised his national profile by speaking out on Soviet-U.S. relations and Middle East policy regularly, and he was considered a front-runner for the nomination when he announced the start of his campaign in February 1975. Jackson received substantial financial support from Jewish-Americans who admired his pro-Israel views, but his support of the Vietnam War resulted in hostility from the left wing of the Democratic Party. Jackson chose to run on social issues, emphasizing law and order and his opposition to busing. He was hoping for support from labor, but the possibility that Hubert Humphrey might enter the race caused unions to offer only lukewarm support. Jackson made the fateful decision not to compete in the early Iowa caucus and New Hampshire primary, which Jimmy Carter won after liberals split their votes among four other candidates. Though Jackson won the Massachusetts and New York primaries, he dropped out on May 1 after losing the critical Pennsylvania primary to Carter by 12% and running out of money. Jackson died suddenly at the age of 71 in Everett of an aortic aneurysm, shortly after giving a news conference condemning the Soviet attack on Korean Air Lines Flight 007. News reports showed video of Jackson in which he was seen reflexively massaging the left side of his chest while talking and speculated that it was his reaction to an early symptom of the fatal attack. He was greatly mourned; Senator Daniel Patrick Moynihan stated, "Henry Jackson is proof of the old belief in the Judaic tradition that at any moment in history goodness in the world is preserved by the deeds of 36 just men who do not know that this is the role the Lord has given them. Henry Jackson was one of those men." Jackson is buried in Evergreen Cemetery in Everett. The Jackson extended community of staff, colleagues and family members created the Henry M. Jackson Foundation from public monies and private donations to give grants to nonprofits and educational institutions. Board members have included Richard Perle, Tom Foley, and Jeane Kirkpatrick. On March 28, 1981, he gave the principal address at the christening of the USS Bremerton (SSN 698). The Bremerton was the second ship to have the name, preceded by the USS Bremerton (CA 130). 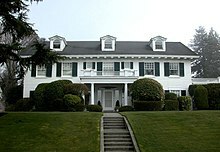 It was christened by Mrs. Henry M. Jackson on July 22, 1978. The USS Bremerton (SSN 698) was mentioned in the classic Tom Clancy novel, The Hunt for Red October. The US Navy Ohio-class ballistic missile submarine Henry M. Jackson was also named after him, in recognition of his longtime support of the nation's military. It is the only Ohio-class submarine not named after a U.S. state. Jackson believed that evil should be confronted with power. His support for civil rights and equality at home, married to his opposition to détente, his support for human rights and democratic allies, and his firm belief that the United States could be a force for good in the world inspired a legion of loyal aides who went on to propound Jackson's philosophy as part of neoconservatism. In addition to Richard Perle, neoconservatives Paul Wolfowitz, Bill Kristol, Charles Horner, and Douglas Feith were former Democratic aides to Jackson who, disillusioned with the Carter administration, supported Ronald Reagan and joined his administration in 1981, later becoming prominent foreign policy makers in the 21st-century Bush administration. Neoconservative Ben Wattenberg was a prominent political aide to Jackson's 1972 and 1976 presidential campaigns. Wolfowitz has called himself a "Scoop Jackson Republican" on multiple occasions. Many journalists and scholars across the political spectrum have noted links between Senator Jackson and modern neoconservatism. Peter Beinart, author of The Good Fight: Why Liberals—and Only Liberals—Can Win the War on Terror and Make America Great Again, argues that the Democratic Party should return to Jackson's values in its foreign policy, criticizing current-day neoconservatives for failing to adopt Jackson's domestic policy views along with his foreign policy views. Senator Jackson's documents were donated to the University of Washington shortly after his death in 1983, and have been archived there ever since. When the materials were donated in 1983, university staff removed all information considered classified at the time. Additional materials were added to the collection until 1995. At some point, library staff discovered a classified document in the collection and sent it to the government for declassification. In response, in the summer of 2004, a man who identified himself as an employee of the Central Intelligence Agency (CIA) called the University of Washington asking to inspect Senator Jackson's archived documents housed there. He found a document labelled as classified and showed this to a librarian. In February 2005, twenty-two years after Jackson's death, a 5 person team including staff of the CIA, Department of Defense, the Department of Energy, and the Information Security Oversight Office came to library to review all of Jackson's papers to remove anything still considered classified, or reclassified since then. The Department of Energy found nothing of concern, but the CIA blanked lines in about 20 papers and pulled 8 documents out of collection. As of 2018[update], some files in the collection are available only to those regarded by the library as "serious researchers", who must first sign a release not to divulge some of the information contained in the files. ^ a b c d e f g h Oldham, Kit (August 19, 2003). "Jackson, Henry M. "Scoop"". History Link, The free online encyclopedia of Washington state history. ^ "SENATOR HENRY M. JACKSON IS DEAD AT 71". The New York Times. September 3, 1983. Retrieved March 11, 2016. ^ Oldham, Kit (November 1, 2003). "Voters re-elect Senator Henry Jackson and six U.S. Representatives on November 4, 1958". HistoryLink.org. ^ a b Kaufman, Robert G. (2011). Henry M. Jackson: A Life in Politics. University of Washington Press. pp. 4–5. ISBN 978-0-295-99854-1. ^ Peter J. Ognibene, Scoop: The Life and Politics of Henry Jackson, 1975. ^ Johnson, Lyndon B. (July 22, 1965). "Remarks at the Signing of the Water Resources Planning Act". American Presidency Project. ^ Miller, Paul Steven. "Civil Rights and American Values: Understanding the Legacy of Senator Henry M. Jackson and its Relationship to the Emergence of Disability Human Rights" (PDF). School of Law, University of Washington. Retrieved January 24, 2008. ^ Frum, David (2000). How We Got Here: The '70s. New York City: Basic Books. p. 321. ISBN 978-0-465-04195-4. ^ Oldham, Kit (November 13, 2003). "President Richard Nixon signs Senator Henry Jackson's National Environmental Policy Act into law on January 1, 1970". History Link. ^ "Senate Study Calls U. S. Drug Agents Lax in Checking Alleged Link of Vesco to Heroin". New York Times. March 10, 1975. ^ "Jackson Asserts Ex‐Drug Aide May Have Obstructed Justice". New York Times. June 12, 1975. ^ "SENATE SNUBS CARTER IN BACKING REACTOR". New York Times. July 12, 1977. ^ Weaver, Jr., Warren. "Energy Unit Voted By Senate". New York Times. ^ Carter, Jimmy (October 30, 1979). "Alaska Public Lands Legislation Statement on Approval by the Senate Energy and Natural Resources Committee". American Presidency Project. ^ "Media Influence on National Security Decisionmaking Archived June 2, 2006, at the Wayback Machine", Brookings Institution, December 12, 2001. ^ Alexander Cockburn. Al Gore: A User's Manual, p. 82, 2000. ^ a b c Perry, Nick (May 12, 2006). ""Scoop" out of the shadows". Seattle Times. Archived from the original on September 29, 2007. ^ "Part VIII: White Man's Land", Eliminationism in America, "Orcinus", January 23, 2007. ^ a b c David Wilma and Kit Oldham (November 7, 2003). "State voters elect Dixy Lee Ray as first woman governor of Washington, re-elect Senator Henry Jackson and House incumbents, and prefer Ford to Carter on November 2, 1976". HistoryLink.org. ^ "A Message of Discontent from Wisconsin Archived November 18, 2007, at the Wayback Machine", "AllPolitics", Time, April 17, 1972. ^ a b "Jimmy Carter's Big Breakthrough". Time Magazine. May 10, 1976. Archived from the original on February 11, 2010. ^ "What Would Scoop Jackson Say? Archived September 29, 2007, at the Wayback Machine", Fact-O-Rama, Cybercast News Service. Retrieved June 2, 2006. ^ a b c d e Fryer, Alex (January 12, 2004). "Scoop Jackson's protégés shaping Bush's foreign policy". Seattle Times. Archived from the original on October 15, 2006. ^ "The Henry M. "Scoop" Jackson Distinguished Service Award". Jinsa.org. September 21, 2004. Archived from the original on October 2, 2006. ^ a b Borger, Julian (December 6, 2002). "Democrat hawk whose ghost guides Bush". The Guardian. London. ^ "Ronald Reagan Dies". Paula Zahn Now. CNN. June 5, 2004. Retrieved May 4, 2010. ^ "Empire builders: Neocon 101". The Christian Science Monitor. Archived from the original on September 4, 2005. ^ a b "Return of the liberal hawks". latimes. Retrieved March 11, 2016. ^ Kaplan, Lawrence F. "Regime Change", The New Republic, February 19, 2003. ^ Harrop, Froma. "Dems Need Another Scoop Jackson", RealClearPolitics, November 23, 2005. ^ "Statement of Principles Archived April 30, 2006, at the Wayback Machine", Henry Jackson Society, March 11, 2005. ^ a b Webley, Kayla (February 8, 2005). "CIA looks into papers donated to University". The Daily. University of Washington. ^ Staff writer (February 7, 2005). "Security team to review Sen. Jackson's papers". Seattle Post-Intelligencer. ^ a b Kaste, Martin (March 15, 2005). "CIA's Seizure of Files Raises Questions". Morning Edition. National Public Radio. ^ Gup, Ted (2008). Nation of Secrets: The Threat to Democracy and the American Way of Life. New York: Anchor Books. pp. 120–121. ISBN 978-0-307-47291-5. ^ Bain, Lara (February 15, 2005). "CIA seizes Sen. Jackson papers". Everett Herald. Archived from the original on September 5, 2018. ^ Staff writer (February 21, 2005). "Federal Officials Remove Jackson Documents from UW". Seattle Post-Intelligencer. Retrieved July 15, 2018. ^ "Archives West: Henry M. Jackson papers, 1912–1987". Archives West. February 22, 1999. Retrieved September 5, 2018. ^ "OurCampaigns, Henry Martin "Scoop" Jackson". OurCampaigns. Retrieved November 29, 2009. Wikimedia Commons has media related to Henry Martin Jackson. United States Congress. "Henry M. Jackson (id: J000013)". Biographical Directory of the United States Congress. This page was last edited on 29 March 2019, at 16:05 (UTC).